The Sounders, riding a seven-game unbeaten streak, head in to a first-place showdown Saturday with Sporting Kansas City looking as deep and healthy as they've been all season. About a week ago, Sounders general manager Garth Lagerwey knew he had gone “all in” on Paraguayan midfielder Derlis Gonzalez. With just days to go until the international transfer deadline, it was too late for Lagerwey to start pursuing other impact performers worthy of designated-player money as a fallback in case Dynamo Kiev star Gonzalez didn’t work out. But Lagerwey was reconciled to his all-or-nothing approach, even when talks over Gonzalez ultimately fell apart Wednesday: Feeling the Sounders already worthy of another run at an MLS Cup title. So, when Dynamo Kiev wouldn’t budge on Gonzalez, Lagerwey refused to panic. Sure, he had Plan B types lined up he could have thrown the Gonzalez money at. But none was of Gonzalez’s talent level, nor, in Lagerwey’s thinking, looking like a difference-maker on an already strong club. Sounders fans will get an early taste of how close Lagerwey’s assessment is to reality when the team plays host Saturday to first-place Sporting Kansas City in a battle of Western Conference powers. The Sounders are unbeaten in the past seven games, have not allowed a goal in their past three contests and sit just three points behind the visitors in a four-way tie for second place. And though Lagerwey didn’t add another designated player, as he did a year ago with Nicolas Lodeiro, he did acquire Targetted Allocation Money right back Kelvin Leerdam and midfielder Victor Rodriguez. As the transfer deadline neared, he secured veteran midfield depth via trades to land Lamar Neagle from D.C. United and Calum Mallace from Montreal for fourth-round draft picks in 2018 and 2019. Since the end of last year, Lagerwey has injected youth in an aging roster, importing 13 players either starting their careers or entering their prime. After a slow start to the season, the Sounders are now the healthiest they have been and should be able to roll consistent lineups out there. A healthy back line of Joevin Jones, Roman Torres, Chad Marshall and newcomer Leerdam is largely behind the recent successive clean sheets. Gustav Svensson has also anchored the defensive midfield alongside Cristian Roldan as the Sounders waited for Osvaldo Alonso to recover from a knee injury — which he has done. Now the Sounders have more depth than has been the case all year. Even the most talented players — especially a blossoming attack of Clint Dempsey, Jordan Morris, Lodeiro and Will Bruin — will be pushed for playing time by the likes of Rodriguez and veteran Neagle. Dempsey said Friday the team is more confident in its attack. He wants to see his side “dictate the pace of the game” against a KC squad coming off a victory on penalty kicks Wednesday over San Jose in a U.S. Open Cup semifinal match. 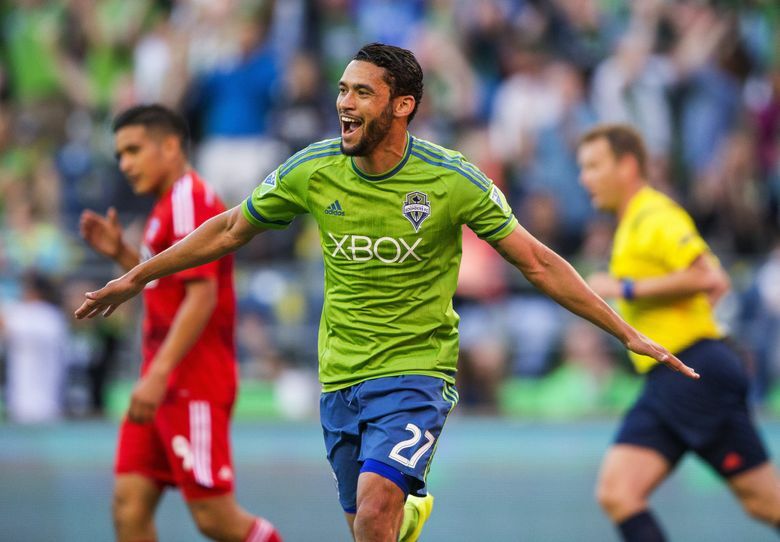 “I just think there’s more confidence in front of the goal for the team as a whole,” Dempsey said. “We’re getting better looks. And I think there’s just a lot of character this year. The game against New England, coming back from (trailing) 3-0 and tying it. The game against D.C. United, coming back and winning that game. Sounders coach Brian Schmetzer said, depth-wise, this is one of the stronger teams he can remember. It will have to be good enough. In Lagerwey’s eyes, depth was the best thing he could add at the moment to a defending champion he feels is pretty stacked when not depleted by injury. Even now, the Sounders are figuring out the extent of a back issue sidelining veteran Brad Evans, which is one reason they brought in Mallace from Montreal. They also saw Lodeiro called up Friday by the Uruguayan national team for World Cup qualifiers this month — which could result in him missing a game against Portland. Still, Lagerwey is confident the Sounders now have enough pieces to cover any gaps without sacrificing needed points in the standings. And since June, those points have been coming by the boatload.